So here is a look at the different fun that Roger Carr has every day. 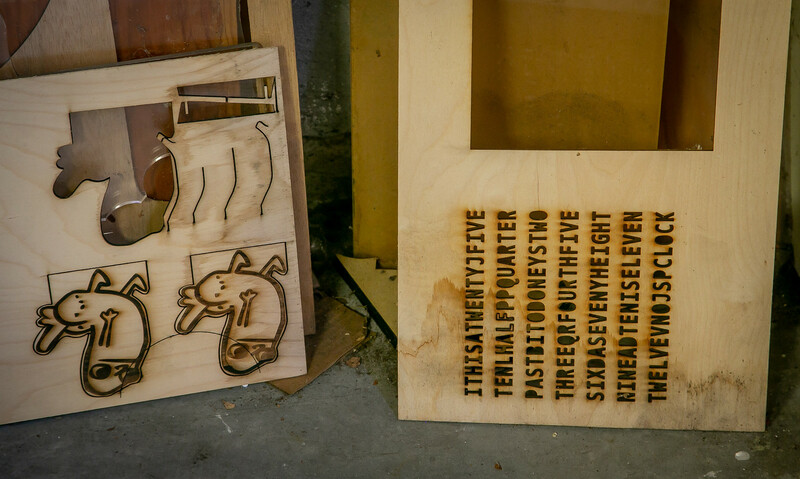 He calls what he makes bumpety bump art machines. As is the case with all that Roger names, this, my friends,is afire name. In late 2015, I posted about Jana Olson and her very quirky lighting fixtures. 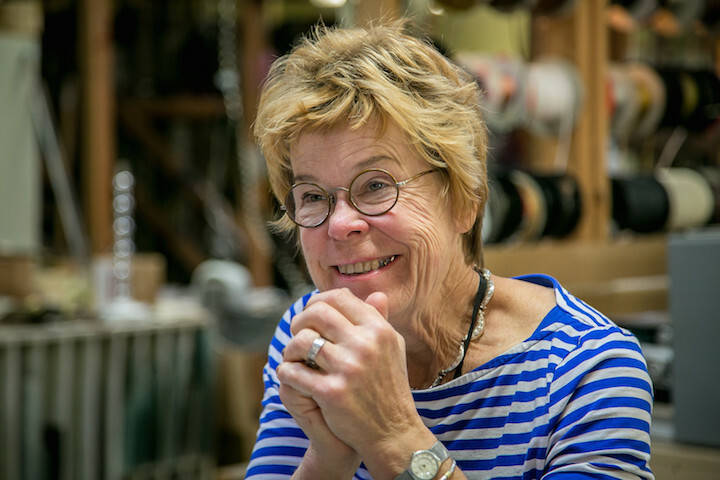 In visiting her Ninth Street Panache Lighting studio (2743 Ninth Street), I met her husband Roger Carr. She describes him as a “feral physicist.” This year I spent time with him and in a week I will go back to the studio to the see the finished product of his 2018 Burning Man installation. I am useless when it comes to physics. I was a very good student in high school. I favored the liberal arts, but I took calculus, took the AP, and placed out of college math. Still, for physics you needed to work a slide rule. 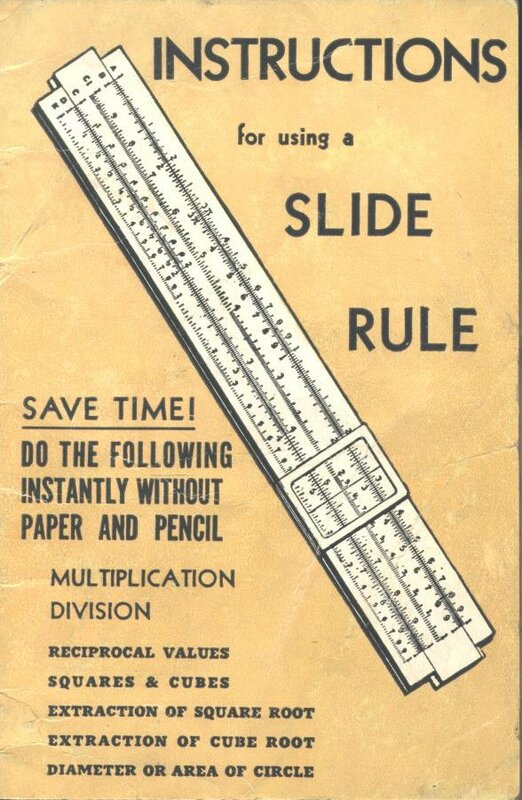 Like Sam Cooke sang in his sweet gospel tenor, “Don’t know what a slide rule is for…” My father tried to coach me with the slide rule. 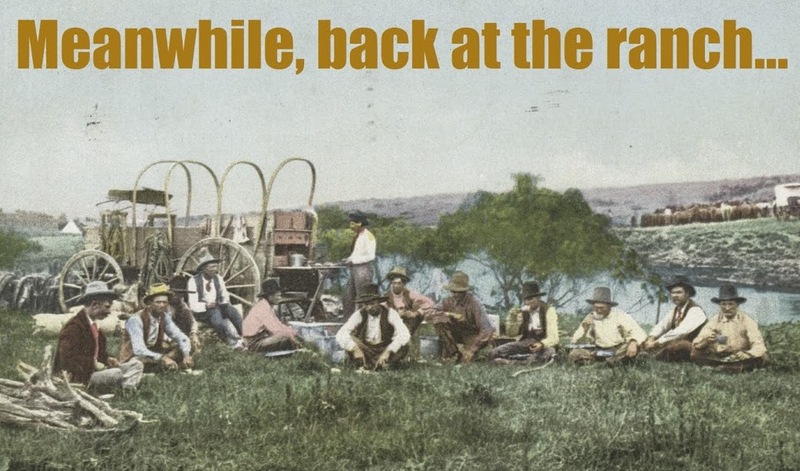 He was a whiz with one. Nothing doing. I could not figure it out. I got a D in physics. That is the only grade below a B that I got in all of high school. Which means – I couldn’t understand much of what Roger was talking about. P.S. About the slide rule issue. Roger has his own foible. During the 1970s, Hewlett Packard used Reverse Polish Notation (RPN) in its calculators. 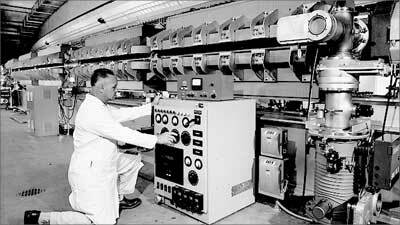 With RPN, operators follow their operands (the quantity on which an operation is to be performed. RPN allowed Hewlett Packard to produce a pocket calculator that could evaluate arbitrary expressions using the available technology. Once the technology to produce algebraic compilers could fit into a pocket calculator, most RPN users decided that RPN was more efficient and consistent. “Polish” refers to the nationality of logician Jan Łukasiewicz, who invented Polish notation in 1924. Polish Notation also answers to normal Polish notation (NPN), Łukasiewicz notation, Warsaw notation, Polish prefix notation or simply prefix notation. In normal Polish notion, operators precede their operands. To non-Polish speakers, “Łukasiewicz” is not easily pronounced, so we lazily reverted to his nationality. The point being – to this day, Roger uses an old calculator that operates on RPN. It is still on its original battery. 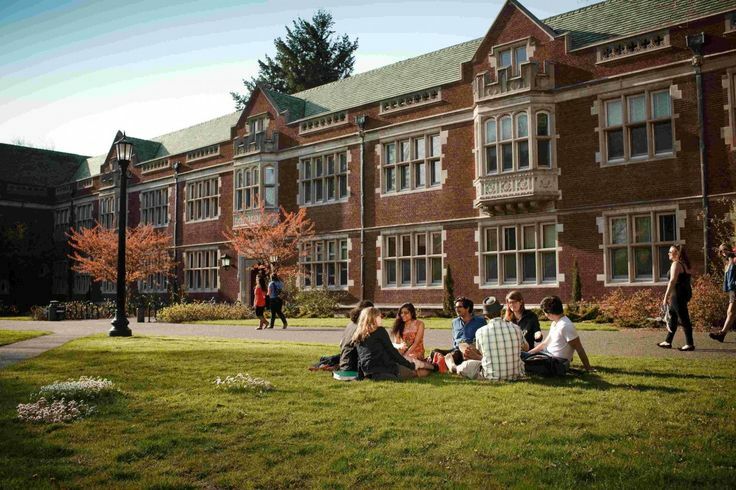 Back to our story – after graduating from Reed, Roger kicked around for five years. He worked with computers and electronics and mechanical things and had fun. Roger entered the PhD. 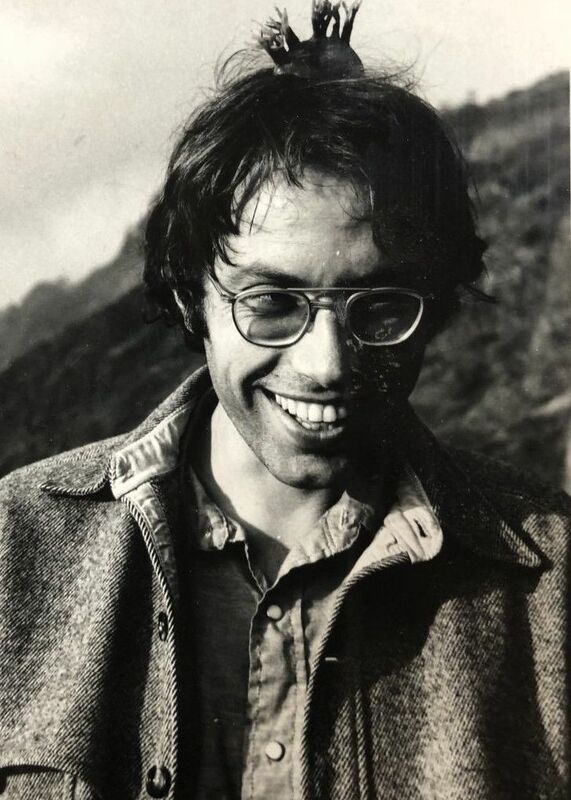 program in Physics at Cal in 1976. Cal had the best physics department in the country. Roger thrived. Because he had the five years of practical experience, he felt that he had an advantage over his fellow students. In 1979, he and Jana Olson met on a hike led by Glenn Seaborg. 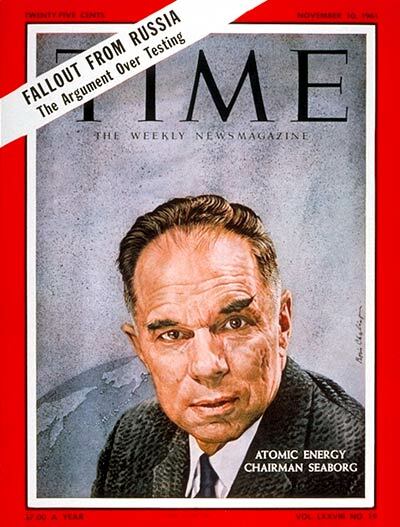 Seaborg was a professor of chemistry at Cal whose involvement in the synthesis, discovery and investigation of ten transuranium elements earned him a share of the 1951 Nobel Prize in Chemistry. He advised ten US Presidents on nuclear policy and was Chairman of the United States Atomic Energy Commission from 1961 to 1971, where he pushed for commercial nuclear energy and the peaceful applications of nuclear science. Throughout his career, Seaborg worked for arms control. 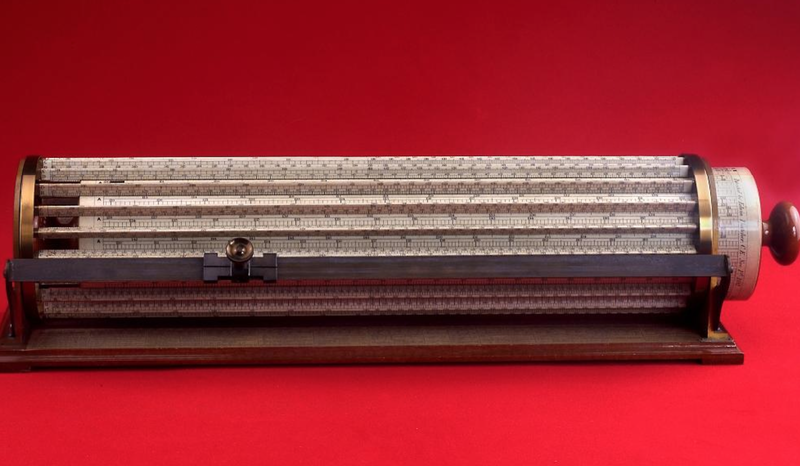 Since I made a big deal about my inability with a slide rule, I present here a photograph of Seaborg’s slide rule. Roger went on the hike to meet Seaborg, a passionate hiker who with his wife Helen would hike 10 to 15 miles in the East Bay hills every weekend that he was home. Olson was on the hike because she was working for the Regional Parks and just liked hiking. Roger and Jana went out for a little while but he then headed to New York. 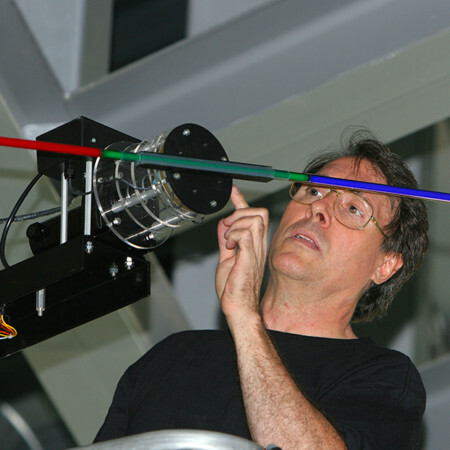 Roger did post-doctorate works at the Brookhaven National Laboratory in Long Island. He worked on the he NSLS (National Synchrotron Light Source). an x-ray source. After Brookhaven, Roger went to work for the Stanford Synchrotron Radiation Laboratory (SSRL), a division of SLAC (the Stanford Linear Accelerator Center). The lab provides synchrotron radiation, the electromagnetic radiation in the x-ray, ultraviolet, visible and infrared realms produced by electrons circulating in a storage ring at nearly the speed of light. 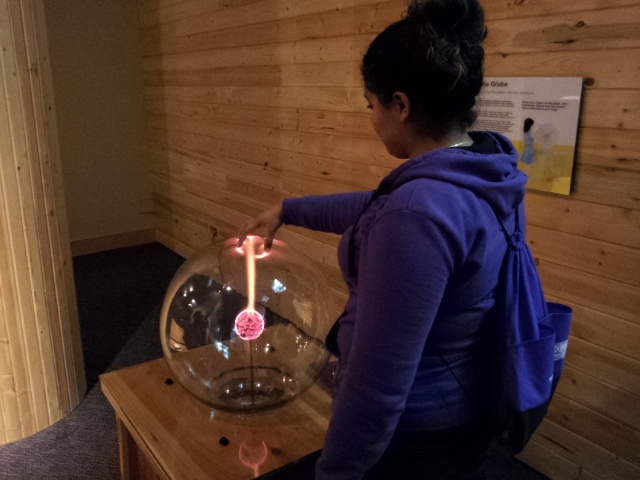 This produces extremely bright light that can be used to investigate various forms of matter. The Laboratory is a user facility, meaning that researchers can use the facility for experiments that would not be possible or practical without the lab. 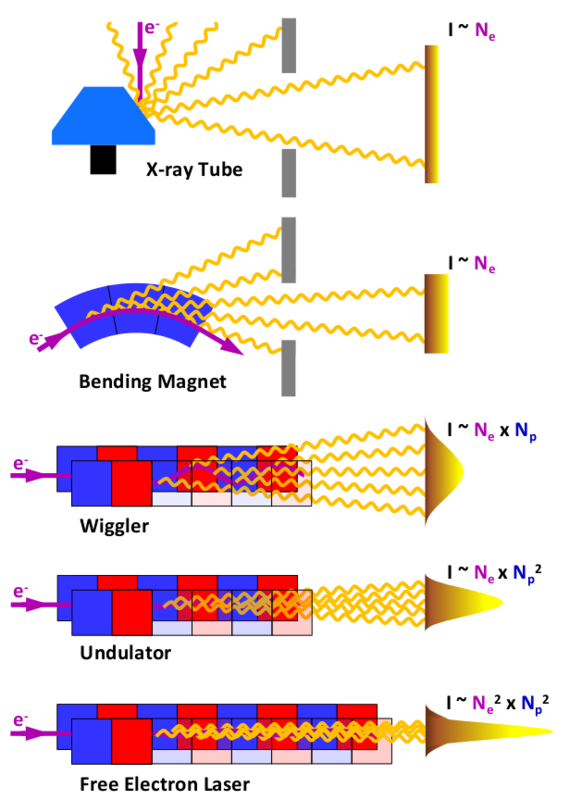 At SSRL, Roger started inventing magnetic insertion devices known as wigglers and undulatory to accelerate the electrons. An undulator produces ‘brighter’ radiation, meaning that it produces more x-rays AND crowds them into a narrower beam. The undulator produces up to 10,000 times as much radiation as the storage ring did alone. And then came the changes for Roger. In 1999, he got a $2000 insurance check after somebody smashed his car and with the money he took a course on titanium welding in Ashland, Oregon. He says that Ashland is the Detroit of bikes. 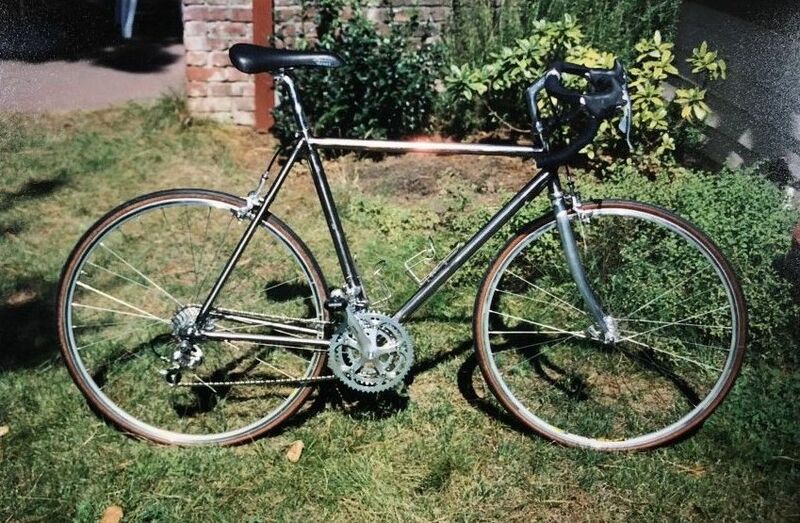 He wanted to weld together a titanium bike. 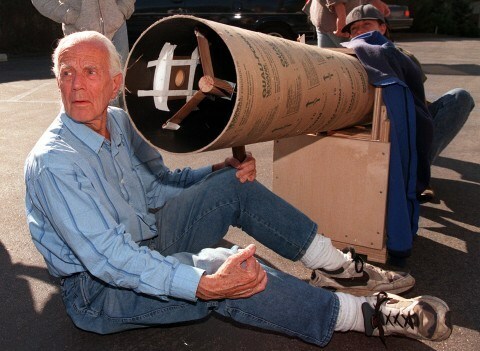 In 2002, Roger took a course from John Dobson on making telescopes. Dobson revolutionized the design of amateur telescopes. 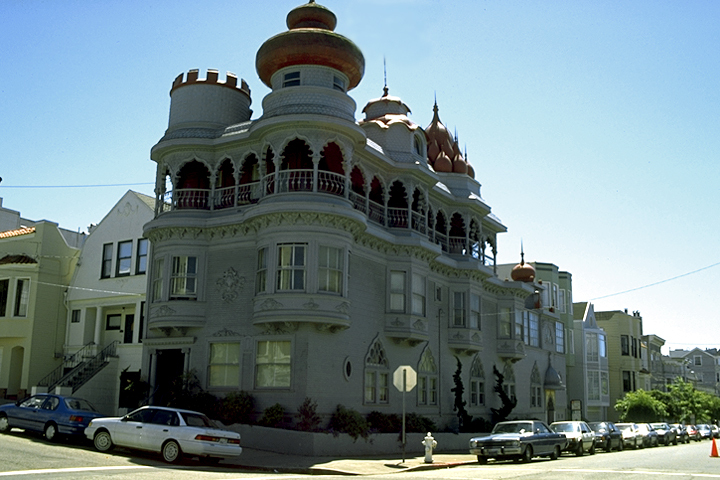 Dobson lived for many years in the Vedanta Society monastery in San Francisco as a monk of the Ramakrishna Order. 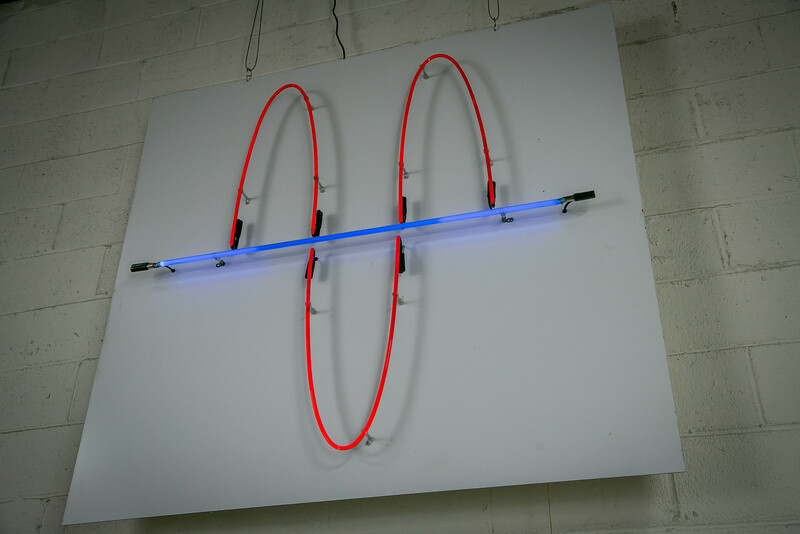 Roger took a course on neon at the Crucible, taught by Christian Schiess. NEON! If you want to know what I think about neon, read here. If you don’t want to know what I think about neon, proceed. 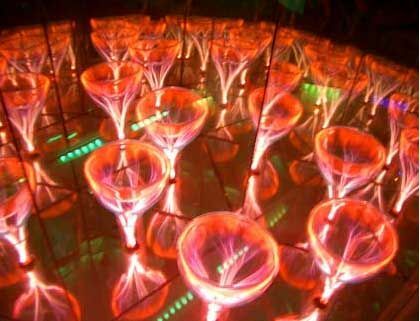 In 2001, more or less, Roger teamed up with neon artist Ed Kirshner of Oakland to make a plasma kaleidoscope. 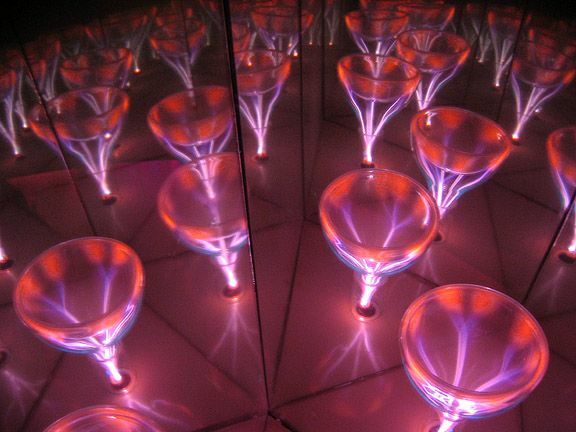 You look into the cabinet, and a single plasma light is replicated hundreds of times with mirrors. This thing rocks! 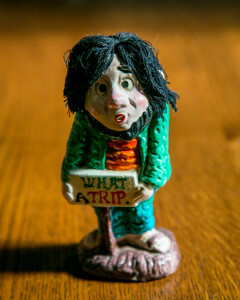 It stood in the Exploratorium for many years and then moved to the Museum of Neon Art in Los Angeles. 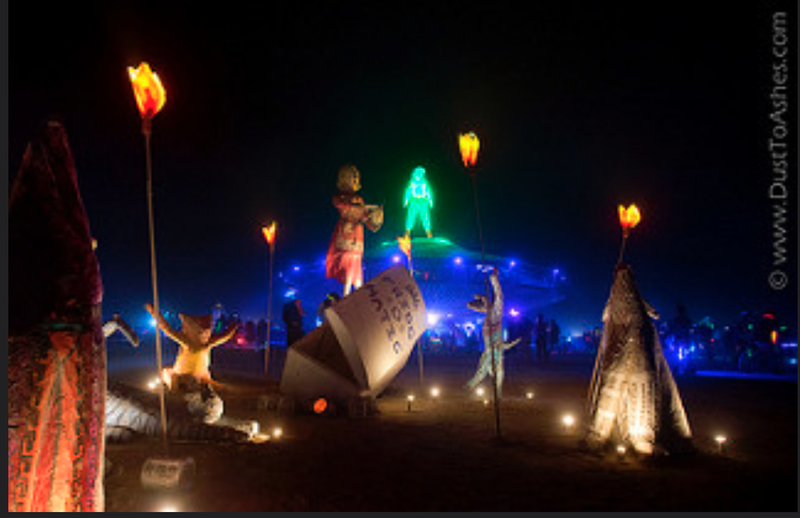 Roger dabbled in Burning Man. He went a few years as a tourist, then in 2002 made his first installation. 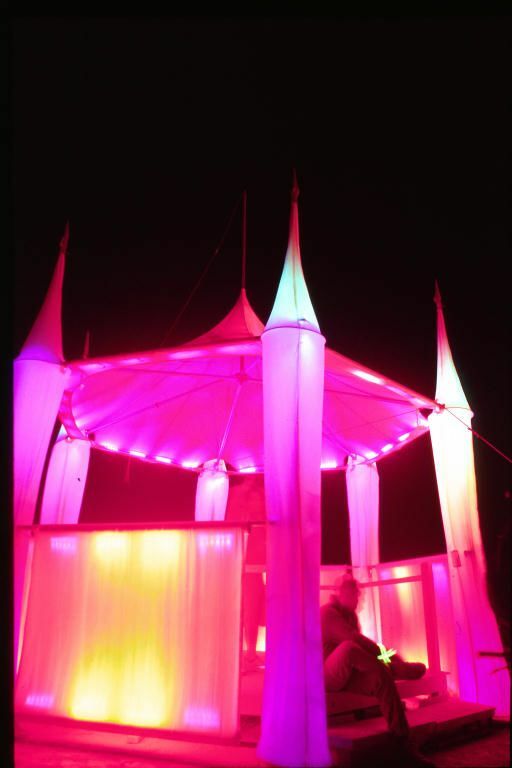 The installation was called Dances of Light. 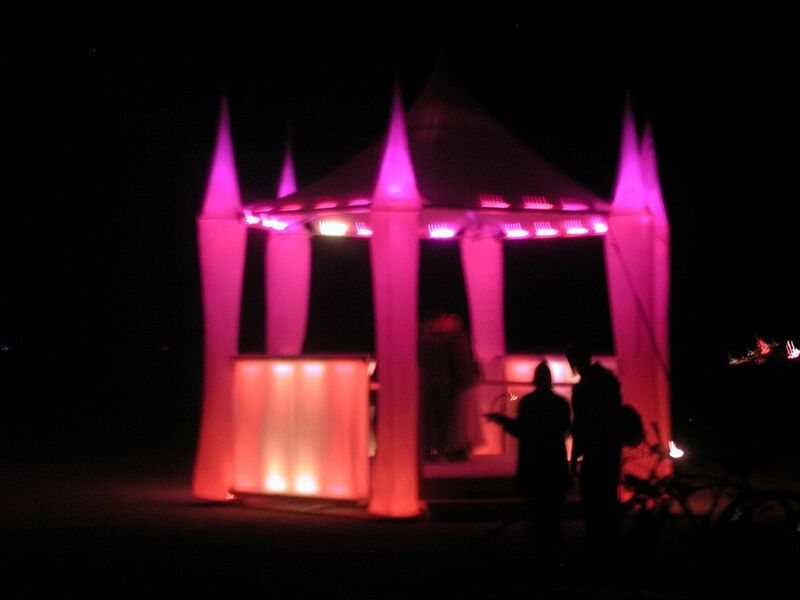 It was a picket fence of 192 four-foot fluorescent lights, arranged in an arc about 150 feet long, individually controlled by Roger using a computer. He made an installation in 2003, again with computer-controlled lights. It was called Spirata Luminosa. 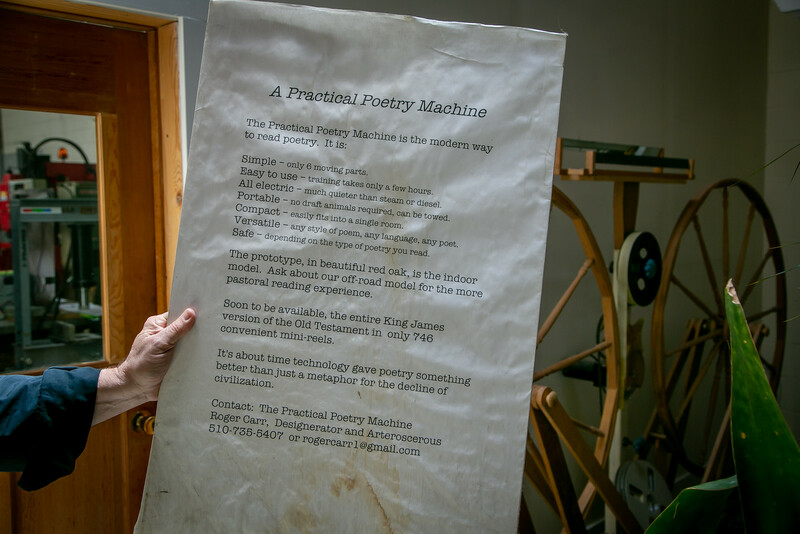 In 2007, Roger made the Practical Poetry Machine for a Maker’s Fair. Here it is explained. Please tell me you understand that this is a put-on? He reached the age at which his father had died. He saw that he and his colleague were sitting in a chair all day and he felt like he could do his job in his sleep. He saw that friends who were their own bosses were happier than those working for large institutions that keep employees in a child-like state by making decisions for them. 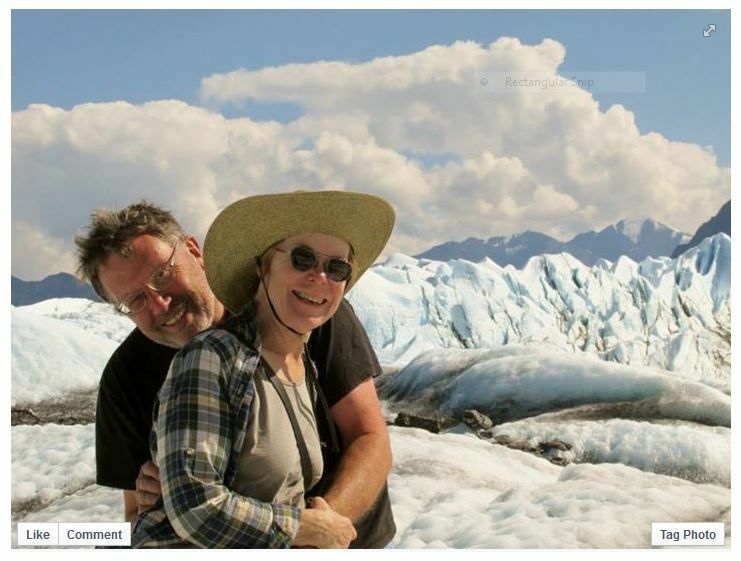 And meanwhile, in the middle of this journey from SLAC, Roger and Jana Olson found each other after 24 years of silence. Roger: “Jana had married and divorced. She had a wonderful Arts and Crafts house in the Berkeley hills, with a 2/3 acre garden on Cordonices creek. Her garden was featured on a tour, which meant that she spent a couple of months preparing it. Having done all that work, she threw a party the evening after the tour. By chance, she had also found me on Google, because I’d published a lot of physics papers. So she invited me to this party, and we struck up a new acquaintance. One of our first dates was a week in Vienna where we went to see Jugenstil art and Hundertwasser architecture.” I have great photos of Jana’s house in the hills in my post about her. They got along this time. They married. She took all she knew about lighting and beauty and started Panache Lighting. They found their creative stride together. 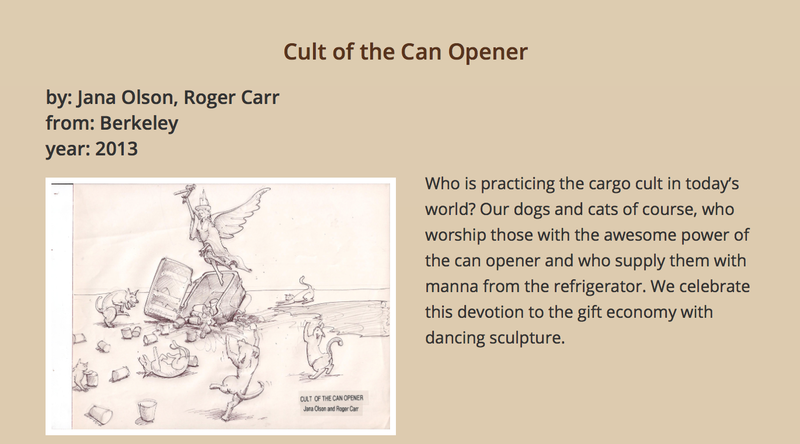 For their 2013 “Cult of the Can Opener” installation, Roger and Jana worked with the theme of that year’s Burning Man – the Cargo Cult. The most widely known period of cargo cult activity occurred in the Melanesian Islands during and after World War II. A small population of indigenous peoples observed the war. Both Japan and the United States airdropped a massive amount of cargo, including clothing, medicine, food, tents, and weapons. The soldiers often shared with the islanders, many of whom had never seen outsiders before. 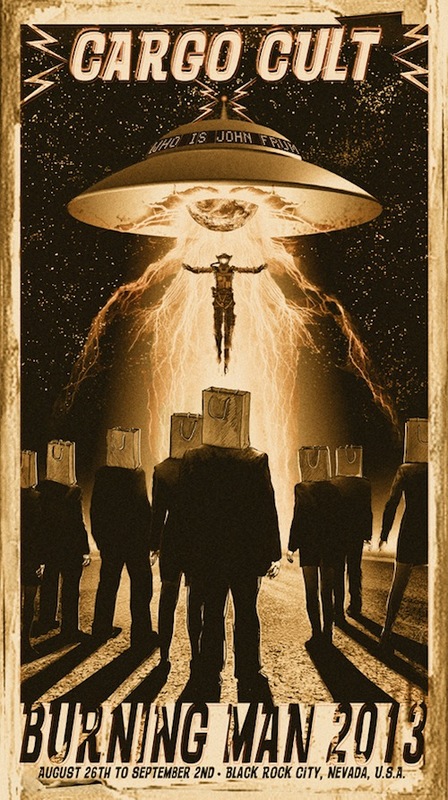 The Cargo Cult was a religion that held that if the correct ceremonies were performed, shipments would be sent. The adherents built replicas of airports and airplanes to initiate the delivery of cargo. Dogs and cats. The idea had been to submit the papier mâché dogs and cats to the burn. Nope – they were “adopted” out – people wanted them and took them. 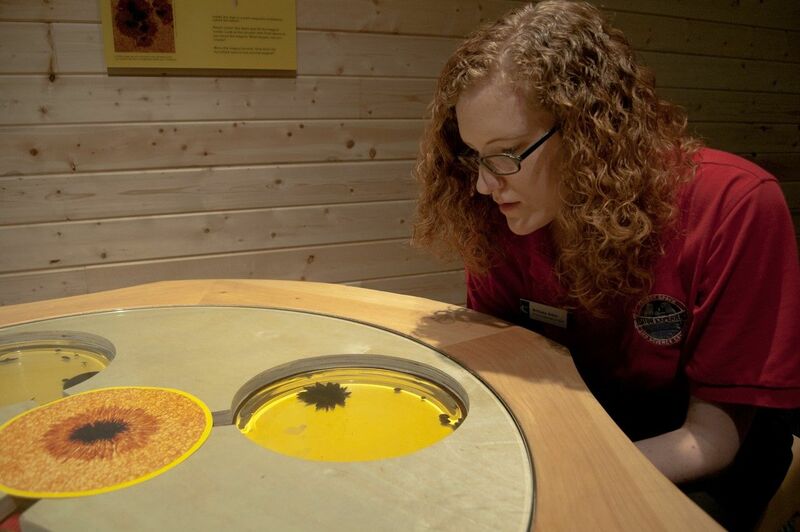 At about the same time, in about 2013, he was commissioned by the Chabot Space and Science Center to build a ferrofluid display as part of their “Touch the Sun” exhibit. 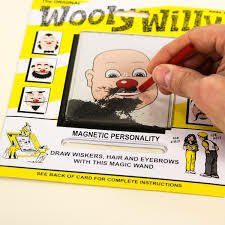 Is it just me or this just a tad evocative of the Wooly Willy toy? The trick was in the solution. Roger published the formula as an “Instructable” in Make Magazine. Last summer I posted about a Burner work space in Reno where I met Mischell Riley, the sculptor who made this DaVinci bust for Burning Man. 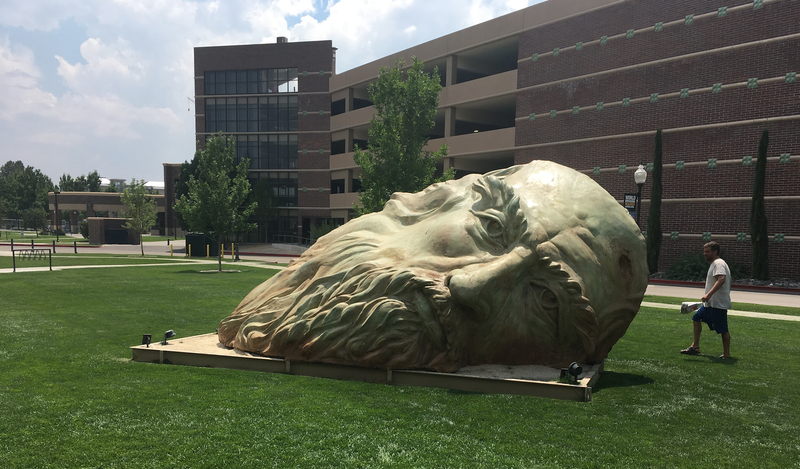 After the burn, DaVinci came to the University of Nevada, Reno – shown here. 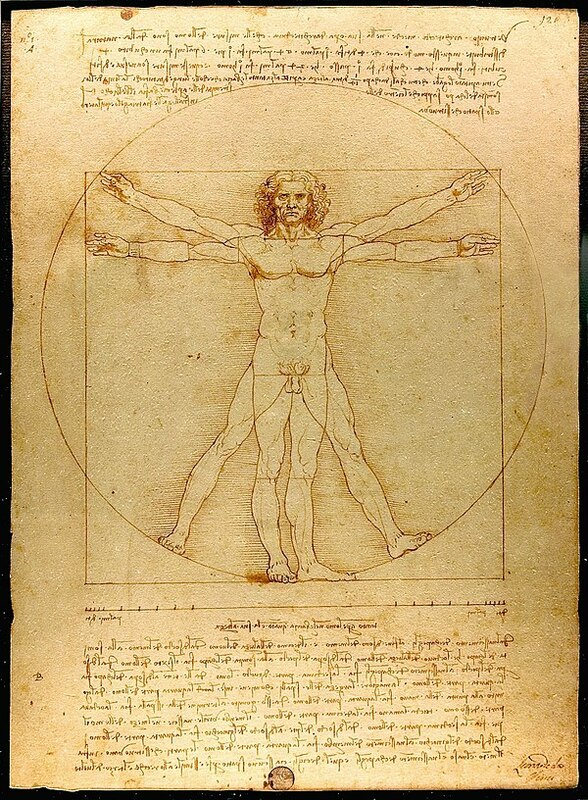 In around 1490, DaVinci made a drawing that in Italian was called “Le proporzioni del corpo umano secondo Vitruvio,” which is translated to “The proportions of the human body according to Vitruvius. Vitruvius was an ancient Roman architect. 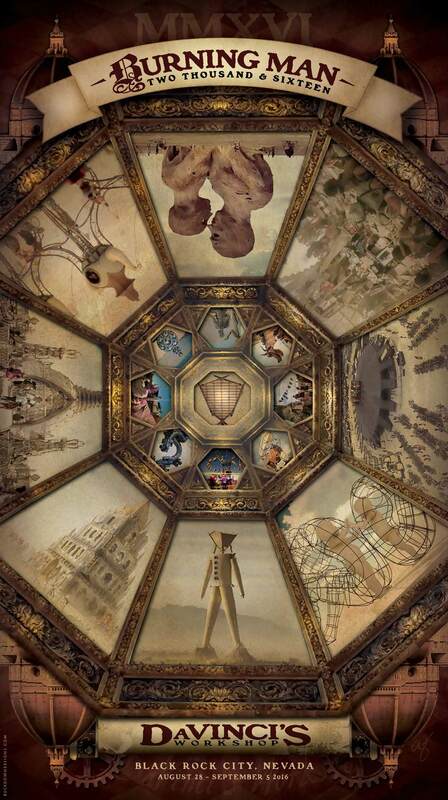 The DaVinci drawing was intended to show what Vitruvius called the Cannon of Proportions or Proportions of Man. 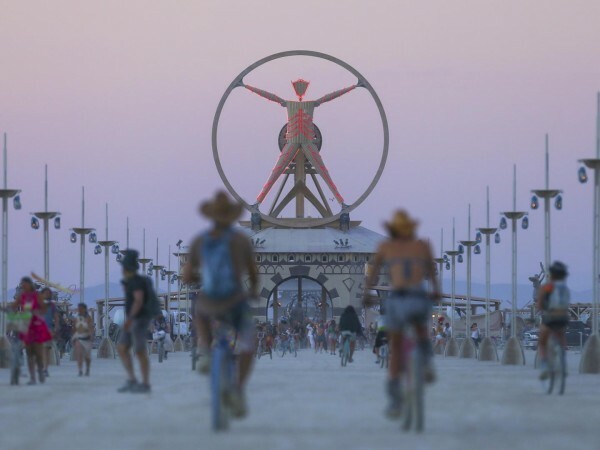 The Burning Man Vitruvian Man – Uomo Vitruviano – was to be rotated ever hour on the hour using an elaborate system of human-powered gears. It did not actually happen for mechanical reasons. 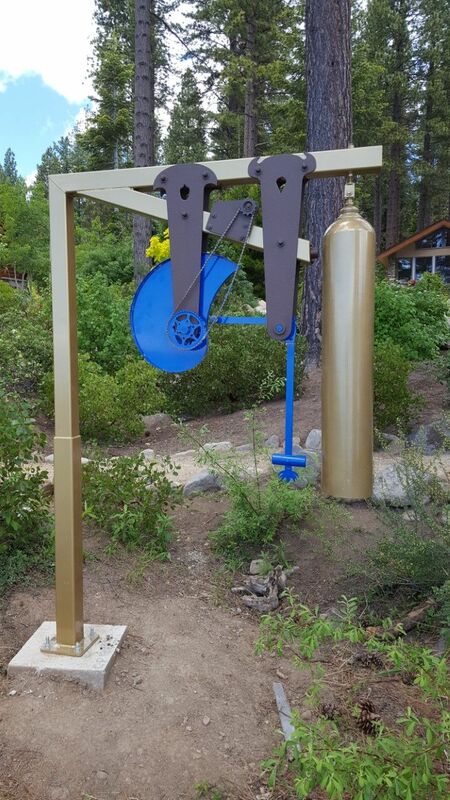 Burning Man put up a competition to design the bells to call Burners to rotate. 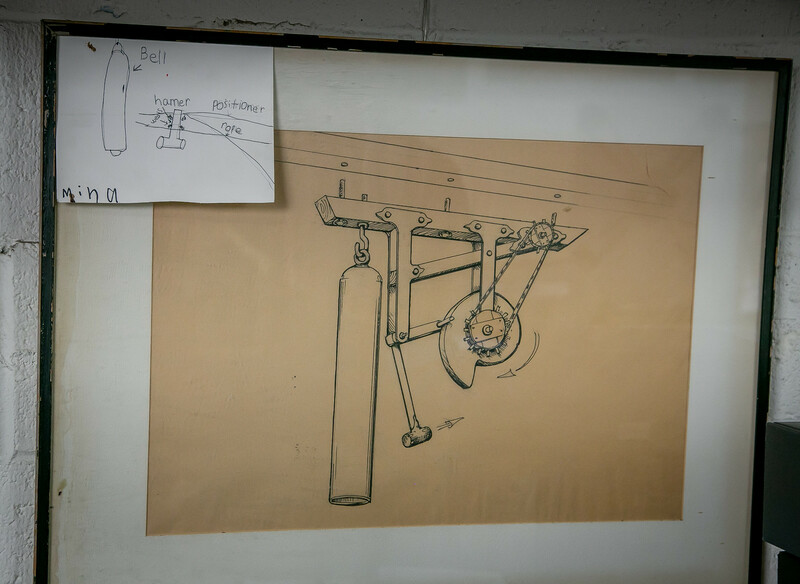 Roger’s proposal was chosen over many other entries, partly because he consulted Da Vinci’s notebooks and noticed a design that could be modified for the bell system. Photo courtesy of Roger Carr. 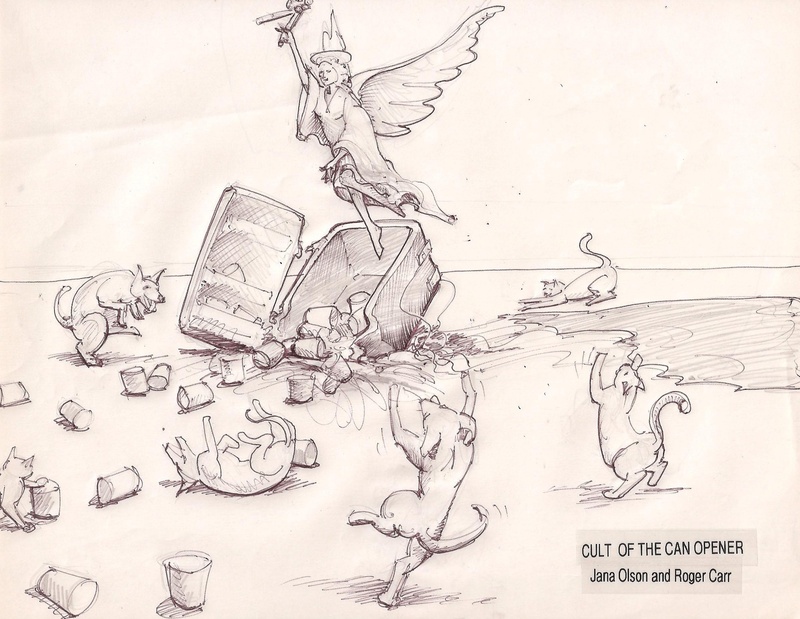 Roger’s work was auctioned off. It was powder-coated by the new owner but you can see the basic mechanism. These days Roger tinkers. Roger thinks. Roger makes. Roger experiments. Roger fiddles. Roger has fun. For me, this evokes Kilroy Was Here. 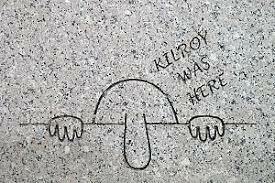 Kilroy was also known as Chad, Mr. Chad, Smoe, Clem, Flywheel, Private Snoops, Overby, The Jeep, and Sapo. 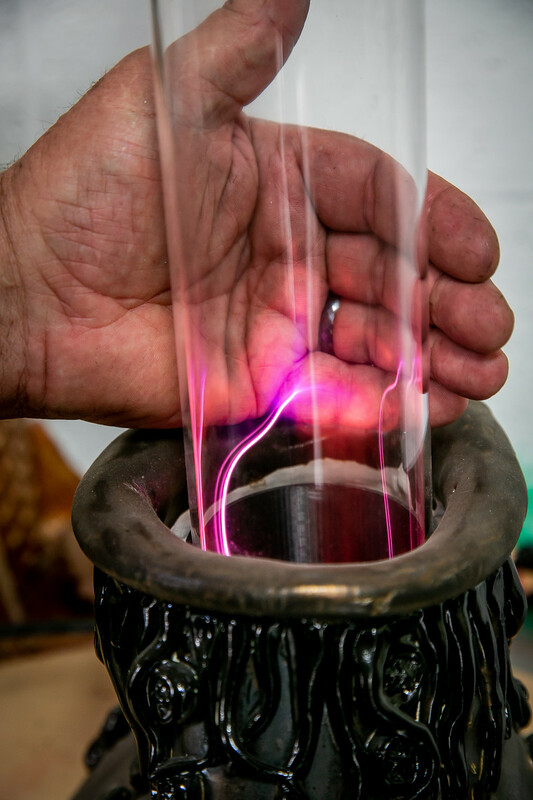 Neon is fun – so is plasma. Roger made this lamp.The glass comes from Adams and Chittenden Scientific Glass on 8th Street. 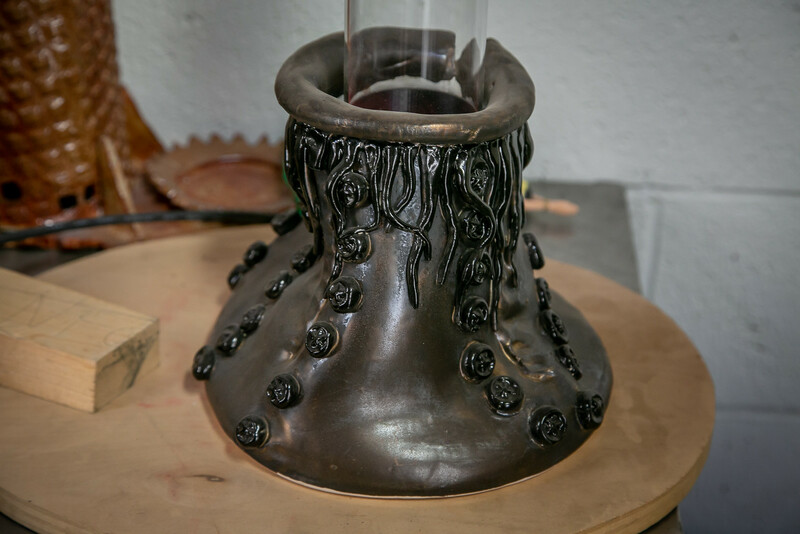 Jana Olson made the base. Here are some more things that Roger works with. 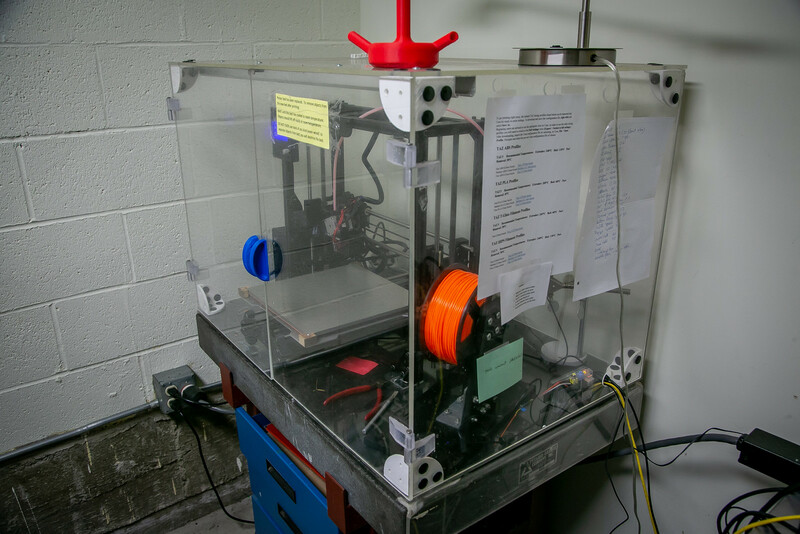 Roger uses this 3-D printer almost every day. 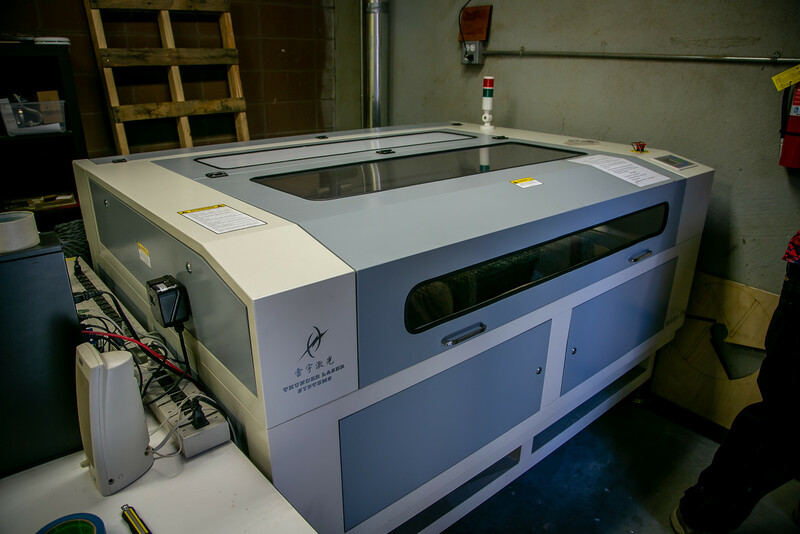 Roger went in with a group to buy this laser cutter. Fun! 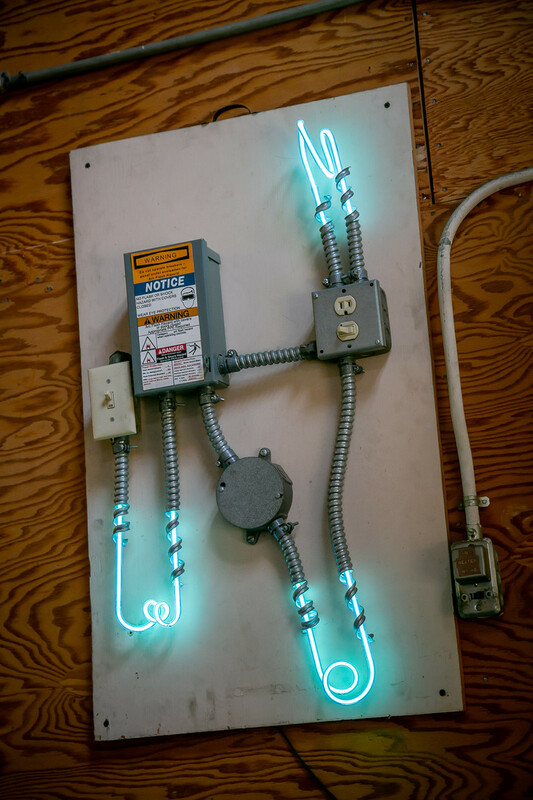 Roger wrote me about this neon project: “I just did this for a friend in San Francisco. 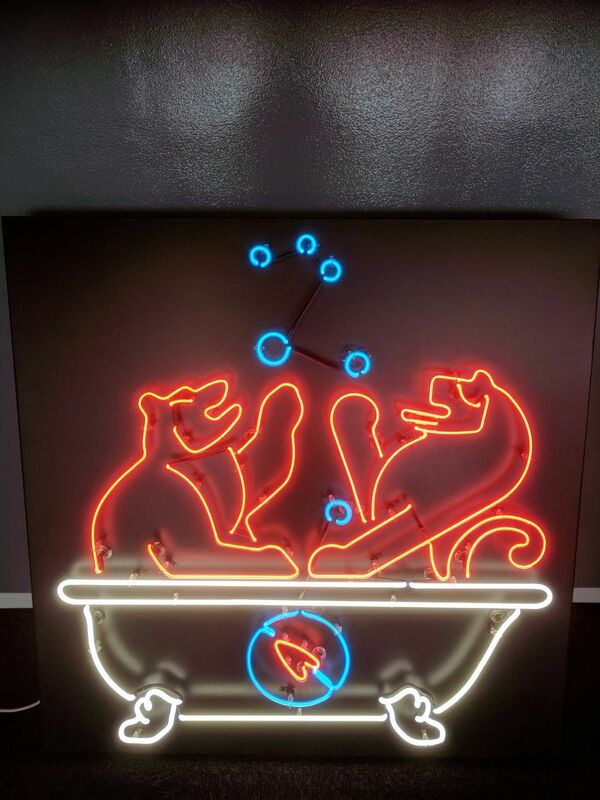 The idea was mine, but I had it fabricated by a professional neon guy. The friend leads a research group for a big Swiss bank in San Francisco. The lion is from the Zurich coat of arms, the bear is a California grizzly, and they are having fun coming up with new ideas. This brings us to Burning Man 2018. I will present on Roger’s project for 2018 in a later post. 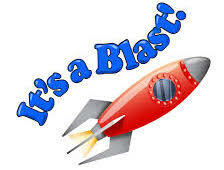 It’s a blast. To me, what Roger does is a blast. While he loved what he was doing at Stanford, he sensed that there was something more, and he acted. He took classes. 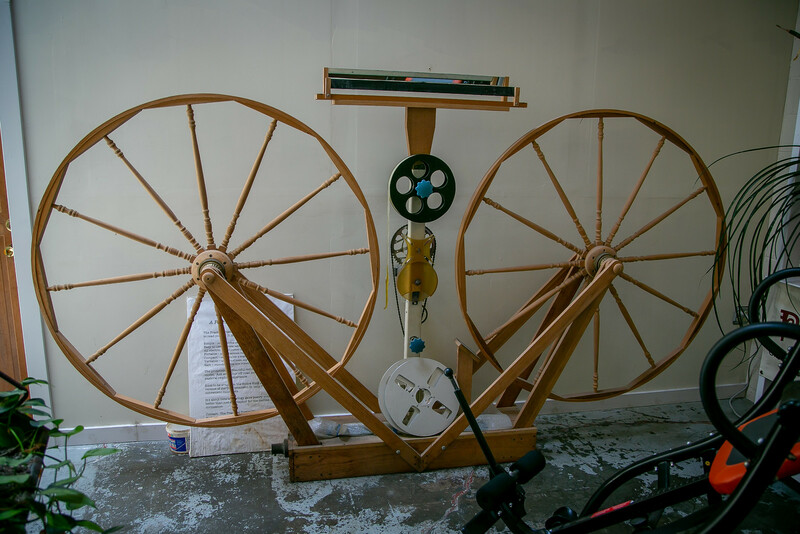 He started making things for the sake of making things. 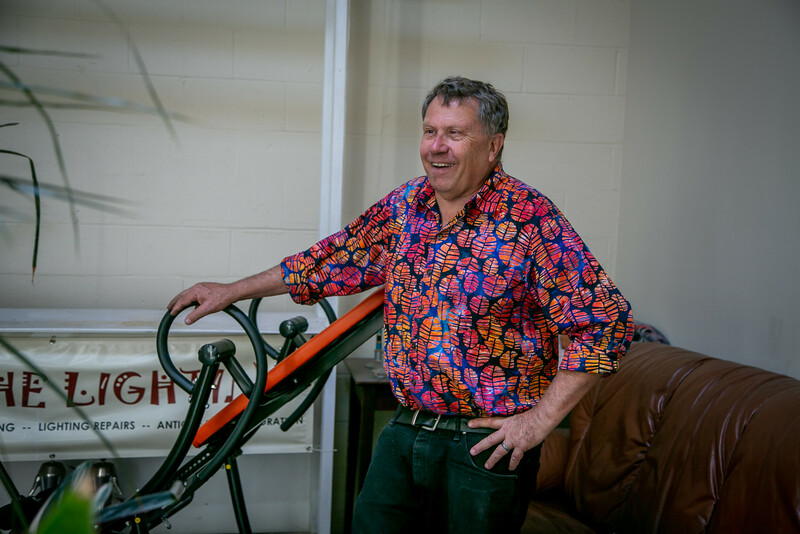 He has fun and has found joy in what he makes. 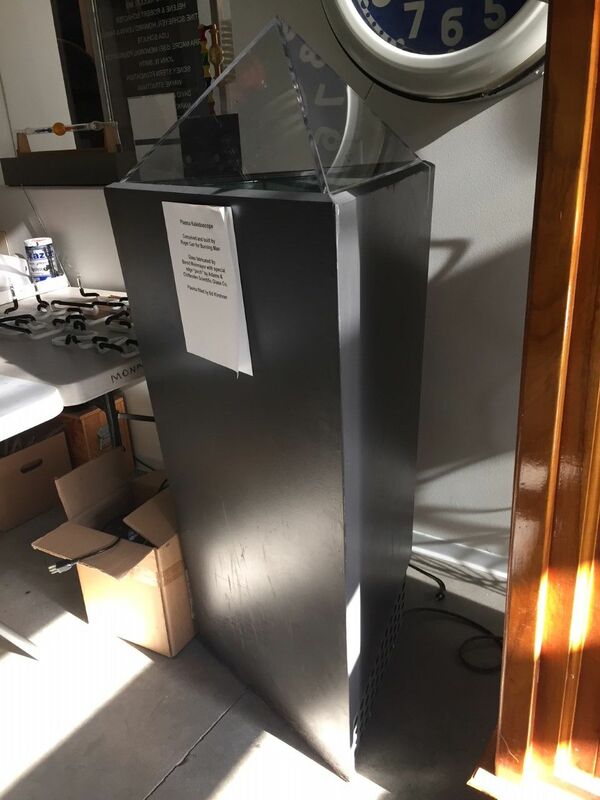 He recently showed me the motion detector and solar panel that make the eyes of two dragons on top of the gate into the studio light up at night when somebody walks by. Joy! I envy his freedom and joy. I did not understand a single word of what he said, and he knew it. Once in a while he likes to show off to put me in my place. I got back to safe ground. What does he think of the post and Roger Carr’s idea of fun?